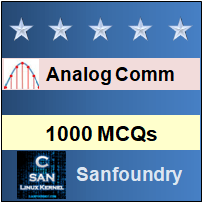 This set of Analog Communications Multiple Choice Questions & Answers (MCQs) focuses on “Source of Information”. Explanation: FM stands for Frequency Modulation. It is the encoding of information on a carrier wave by varying it’s frequency with respect to the instantaneous amplitude of the message signal. Rest other options are the components used in the process of frequency modulation. 2. Why a sinusoidal signal is considered analog? Explanation: A sinusoidal wave is an analog signal. An analog electrical signal is a signal with infinite number of amplitudes in the range of values of independent variable. Analog signals can take on any value in the continuous interval. Explanation: For effective transmission, height of antenna should be one-forth of ʎ. (H = ʎ⁄4 where ʎ = c⁄f). The reason for maintaining antenna height to ʎ/4 is for matching impedance. It means that the antenna is atleast 1/4th above ground level. 4. What do you understand by the term analog communication? Explanation: Analog communication means that information is transmitted in the form of a continuous signal through the process of modulation. Rests of the options are applicable for digital communication, where coding is applied. Explanation: Demodulation is the process of recovering information from a modulated carrier wave while it is modulation in which properties of a periodic waveform is varied. A modulator is a device that performs modulation while demodulator performs demodulation. A modem can perform both functions. Explanation: A Demodulation is a process of recovering the information signal from a modulated carrier wave, in which properties of a periodic waveform is varied. A modulator is a device that performs modulation while demodulator performs demodulation. The process of mixing a signal with a sinusoid to produce a new signal is done by a mixer. Explanation: The input signal is divided into sub-components, where each sub-component is processed individually and reunited. The result is tested for additivity and homogeneity and if it satisfies both, then the system is said to be linear. It also follows superposition property. Explanation: Cross modulation generally occurs in receivers receiving an AM signal in the presence of other strong AM signal. The modulation from the strong signal cross modulates and appears on the weaker signal being received. Explanation: Channel is the medium through which information is transmitted. Transmitter is used to process the electrical signal through different aspects. The transducer is used to convert a message signal to an electrical signal. Loudspeaker is a type of Transducer. Explanation: A telephone converts sound waves into electrical signals which are suitable for transmission over long distances, where it is converted to sound waves again, through a transducer. The essential components of a telephone are a microphone which acts as a transmitter and an earphone which acts as a receiver. Explanation: Cell phones transmit information in form of radio waves to communicate with each other. Radio waves are transmitted in all directions by the cell phone, and they travel at the speed of light in air or vacuum. Explanation: The ability of receiver to select wanted signal from various incoming signals is called selectivity. It rejects the other signals at closely lying frequencies. Sensitivity is the ability of the receiver to amplify weak signals. Fidelity is the feature of receiver to reproduce all modulating frequencies equally. While modulation is the process of varying one or more properties of carrier signal with respect to the modulating signal. 13. Which device is used for tuning the receiver according to incoming signal (especially in TV)? Explanation: Varactor diode is a diode working in the reverse-bias because of which no current flows through it. It has variable capacitance which varies with applied voltage. Varactor diodes are mainly used in Voltage Controlled Oscillators (VCOs) and RF Filters for tuning the receiver to the incoming signal or different stations.